�����Long-time collectors are always looking for bargains and there are many out there if you meticulously study a series carefully. There are coins that offer advantages if they have a good track record of historical value and others that are sought for their low population for the grade. The Barber series is always popular and is full of rarities, and if you look at the upper grades, you can certainly find some that are priced within a variety of budgets. The following chart shows high end Barber coins that have been traded recently. 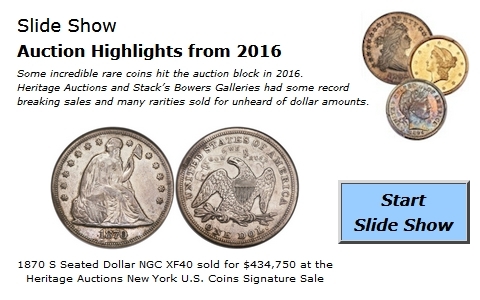 We have also included the total coins certified by NGC and PCGS for the grade. �����What you may find interesting with these coins is that only a few of them actually have what we would consider to be low mintages; most of them had mintages well above a million and most approached two million. The rarity factor really shows up as the grade increases and the population diminishes. The fewer coins there are in the highest grade simply means there is a limited number of owners of the coin in that specific grade. For the coins above, the demand is currently outweighing the supply and that is why we are seeing FMV prices rising for coins that had original mintages in the millions. �����The Carson City Mint continues to be an extremely popular choice when it comes to collecting coins. This past month we tracked the sale of an 1878 CC Twenty Dollar Gold MS61 PCGS, sold to a collector. There are only five certified in this grade with just two higher. The FMV is $61,750 in MS61 and $73,450 in MS62. If one became available in MS62 the price would likely be much higher because we have not seen one for sale for some time in this grade. The original mintage was just 13,180, with only 576 total coins certified by both grading services at this time. This may not be the rarest, but it is certainly one of the �toughest finds� in the Twenty Dollar CC Collection. 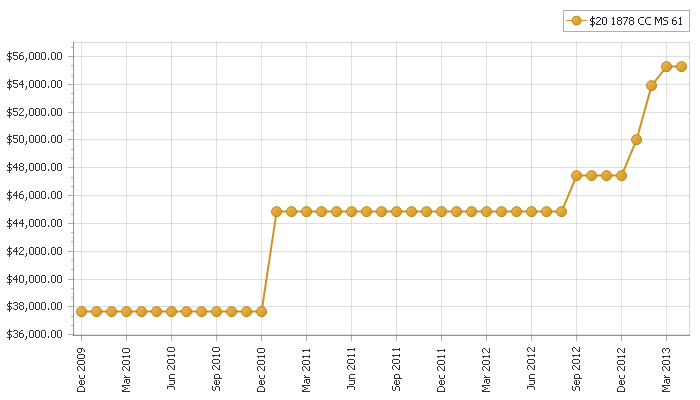 The graph below shows what the MS61 has done over the last four years. �����During the past month we have monitored virtually thousands of graded coins rise in value, many as much as 20% or more. One of the more active series has been Washington Quarters, predominantly in MS67. The following list shows some of the most active dates along with the latest FMV and the percentage increase for the date. Check out other increases online.